Brazil and the US account for 60 per cent of chicken meat exported by the Americas, while Argentina's trade has shown steady progress over the last decade, according to industry analyst, Terry Evans. World trade in fresh/frozen poultry meat according to the FAO is considered to have grown by 2.1 per cent in 2014 to 13.5 million tonnes. While exports from developed economies looks to have slipped by almost one per cent to 6.0 million tonnes, shipments from the developing countries grew by 4.6 per cent from 7.1 million tonnes to almost 7.5 million tonnes. The trade in fresh/frozen chicken meat expanded by more than five per cent per year between 2000 and 2011 as the total climbed from 6.9 to 12.5 million tonnes (Table 1) although this likely exaggerates the true picture a little since most of the exports from Hong Kong will be re-exports from Brazil and the US, already accounted for in the figures for the Americas. To get the complete export picture however, account needs to be taken of the trade in prepared/preserved chicken meat. The latter have shot up as a result of some importing countries imposing bans on shipments of fresh/frozen products from countries that had been hit by avian influenza. Hence, global exports of prepared chicken products have escalated from less than 600,000 tonnes in 2000 to close on two million tonnes in 2011 (bottom half of Table 1). This is equivalent to around 2.9 million tonnes eviscerated weight, making a world total when added to the fresh/frozen figure in the top half of the table, of around 15.5 million tonnes. That total broiler meat exports published by the USDA are considerable less than the FAO figure for chicken meat is primarily because the USDA excludes sales between European Union member countries. However, as the USDA forecast for broiler meat exports in 2015 of 10.9 million tonnes shows a gain of 1.3 million tonnes or 3.4 per cent per year over the 2011 figure of 9.6 million tonnes, clearly the global trade in chicken meat is continuing to grow apace. Dominated by the world’s leading traders Brazil and the US, it is not surprising that the Americas is the largest exporting region accounting for more than 7.5 million tonnes, or 60 per of the global total in 2012 (Table 1). While also featuring in the global import picture, purchases by the Americas at 1.5 million tonnes represent only 12 per cent of the world total of 12.5 million tonnes, compared with Asia’s 5.8 million tonnes and Europe’s 2.8 million tonnes. Regarding the trade in prepared/preserved chicken meat the Americas accounts for about one-fifth of total exports but less than 10 per cent of imports. In addition, goods can be lost during transport, while occasionally differences can occur due to a typing or calculation error. And, in some instances exports may not be declared to circumvent an embargo or avoid tax payments. Looking at the individual country data (Table 2) clearly Brazil and the US are the key players with their combined exports of some seven million tonnes represented 93 per cent of the regional total of 7.5 million tonnes in 2011. 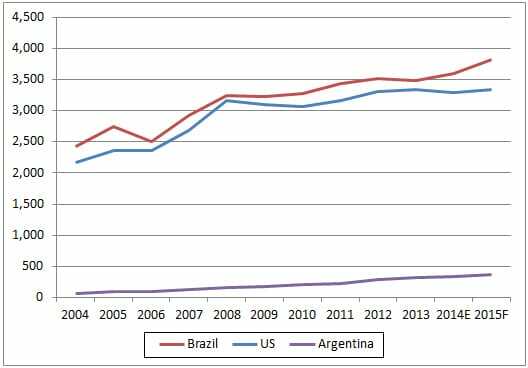 In the early years of the last decade, the United States was the number one chicken meat exporter but by 2004, Brazil had taken over this mantle and has held on to it ever since. Indeed the USDA’s forecasts for 2015 reveal that Brazil is expected to export some 3.8 million tonnes compared with the US’s 3.3 million tonnes (Table 3 and Figure 1). Exports of broilers from the US are forecast to come close to 3.9 million tonnes by 2023. However, OECD/FAO long-term forecasts to 2023 for poultry meat put the exports from both these countries at 4.8 million tonnes. Brazil was the largest exporter to fellow South American countries until it shifted its attention from Venezuela to the Middle East. Consequently, its stake in the South American market slipped from 67 per cent in 2009 to 40 per cent in 2013. Leading customers in 2014 were Saudi Arabia, Japan, Hong Kong, the UAE, Venezuela, the EU and China. Although imports by Russia are expected to decline in line with the continued growth of domestic production, Brazil anticipates capturing a larger share of this market in the short term as a result of the Russian ban on imports from the EU, the US, Canada, Australia and Norway. Prior to the ban, the US and the EU supplied over three-quarters of Russia’s broiler meat imports. It is estimated that some 38 Brazilian plants are now eligible to export to Russia which would allow Brazilian processors to expand their shipments by up to 30,000 tonnes a month early in 2015, according to a USDA GAIN Report. Increased sales of chicken parts are anticipated to China as more plants have been approved to supply this market. The report states 'Other promising markets for 2015 are Japan, Egypt, Nigeria and Mexico'. The Mexican authorities have slashed an import tariff on Brazilian chicken to boost domestic supplies as a result of the bird flu scare. This could increase sales to this market by some 20,000 tonnes a year. For the same reason Brazil is anticipating increased trade with South Korea. As a result of these increased market opportunities, Brazil’s exports in 2015 could rise by more than 11 per cent to exceed four million tonnes. Broiler exports from the United States are expected to expand by a little over one per cent in 2015 to reach a record 3.36 million tonnes from the 2014 level of 3.32 million tonnes. In 2013, US poultry meat exports amounted to 4.1 million tonnes while exports of broiler meat (excluding chicken paws) were 3.3 million tonnes (up one per cent). Top markets were Mexico taking 637,000 tonnes (up 14 per cent), Russia 276,000 tonnes (up four per cent), Angola 207,000 tonnes (up 14 per cent) and Canada 169,000 tonnes (down two per cent). Other important markets included Iraq taking 165,000 tonnes (up 24 per cent), Cuba 139,000 tonnes (down eight per cent), China 131,000 tonnes (up 38 per cent), Taiwan 96,000 tonnes (down 19 per cent), Georgia 86,000 tonnes (up fourper cent) and Guatemala 79,000 tonnes (up 12 per cent). Exports of chicken paws totalled nearly 300,000 tonnes (down 18 per cent). Between 2013 and 2023, US broiler exports are expected to expand by 15 per cent to reach 3.9 million tonnes with Mexico and China major markets. A ruling in favour of the US by the World Trade Organisation (WTO) following a ban by India aimed at preventing imports of US chicken on the grounds of protection from avian influenza, does not give the US automatic access to this market. It does, however, provide the basis for discussions on entry into the Indian market, which consumes some 3.9 million tonnes of chicken a year. US broiler exports represent around 19 per cent of production, underlining the importance of this trade to the US industry. Key factors that have impacted on the growth in sales include increased efficiency in domestic production, income and population growth in the importing markets, changes in exchange rates, trade policy and trade conflicts, and the relative price changes when compared with other meats. Although one-tenth the size of Brazil’s shipments, the expansion in exports from Argentina has been dramatic and is forecast to reach 375,000 tonnes this year (Table 3 and Figure 1). In 2013 Argentina took over from Brazil as the main supplier to South American markets. Its exports are booming due to competitive prices and the rising global demand. More than two-thirds are whole birds, though, according to a USDA report, Argentina’s processors are now concentrating more on producing broiler parts and further-processed added-value items. More than 50 per cent of Argentina’s exports are to South American countries. The leading customer is Venezuela taking over 40 per cent, followed by South Africa, China and Chile, with the remainder being shipped to some 17 countries. It is anticipated that rising chicken consumption in South America and markets in Sub-Saharan Africa and the Middle East will provide further export opportunities. Argentina is also seeking to capitalise on the opportunity to supply some 150,000 tonnes to Russia, which has led a USDA GAIN Report to postulate a forecast for Argentina’s exports in 2015 of some 400,000 tonnes. This figure does not include sales of chicken paws to China and Hong Kong, which amount to around 30,000 tonnes a year. The Mexican National Health and Food Quality Service (SENASA) has granted permission for exports from Argentina following successful health checks in the broiler sector. Imports of fresh/frozen chicken into the America trebled between 2000 and 2011 from 0.6 million tonnes to 1.5 million tonnes (Table 4). Here Mexico was the major buyer taking 564,000 tonnes or 37 per cent of the total in 2011, while Cuba purchased 150,000 tonnes, Canada 148,000 tonnes, Chile 143,000 tonnes, Guatemala 74,000 tonnes and Haiti 67,000 tonnes. These six countries accounted for three-quarters of this business. For 2015, the USDA forecasts chicken imports to Mexico as high as 740,000 tonnes while the corresponding figure for Venezuela is 450,000 tonnes. Some 98 per cent of Mexico’s imports come from the US, while Brazil supplies the bulk of Venezuela’s purchases. Of the 425,000 tonnes of prepared/preserved chicken exported from the Americas in 2011, nearly 250,000 tonnes were shipped by Brazil and 127,000 tonnes by the US. On the importing side, out of the total of 155,000 tonnes, Canada bought 39,000 tonnes, Colombia 38,000 tonnes, Mexico 16,000 tonnes and Chile 11,000 tonnes.